Performers include: Eamonn Holmes (host). 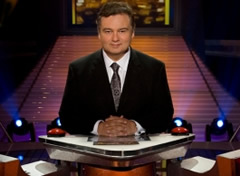 A game show in which strangers are thrown together to form two teams who compete against each other by filling in missing answers on a lists of wide-ranging topics. Contestants bid against each other while predicting how many examples of a particular subject they’ll be able to list. If a team fails to list as many answers as they predicted, the other team wins the round. The winners of the best of three lists move on to play The Rich List, a game of list-making where increasing amounts of money are up for grabs; however, make a single mistake and they lose it all. Episode details for this installment are unavailable. There’s been no news of any plans to revive the series. • The series was cancelled after one episode because of very poor ratings. • The first and only aired episode was actually the second produced. The network had planned to air the first episode at a later date.